Police, FBI and others want to use these laws against normal people who work for a living and enjoy their motorcycle but than anything they want to do away with the lifestyle of the biker. For those of you who don’t live this lifestyle, if you are not in it you will never understand or get what it is all about. It is this lack of knowledge that feeds the ignorance of Law Enforcement Officials, Media, Society and Politicians. From this ignorance comes unjust laws that discriminate against a group people who are just like anyone else but choose to form a brotherhood or fraternity that signifies their way of life. And for the this way of life that we choose to live we have been deemed “Gang Members”, which by their definition means: Is a group of three or more individuals who engage in criminal activity and identify themselves with a common name or sign. ‘‘521. Criminal street gang prosecutions. The professional sports teams all have a sign or symbol and wearing colors and uniforms, and commit crimes on and off the field or court. Why is there not justice there? We even video and play back there moments of violence over and over on TV. On that’s right their commissioner issues them a fine. That sounds really fair and just. And these are the people who “society” says we should have our kids look up to, along with cops who break them laws as well. Then there is the “Biker” who gets the special treatment of: According to the FBI – VIOLENT GANG TASK FORCES target violent street gangs and their associates responsible for gang-related criminal activity. Additionally, they place a specific emphasis on the identification of the major violent street gangs/drug enterprises which pose significant threats to the integrity of our society. The FBI is identifying and targeting violent street gangs as a priority matter by utilizing SSTFs. They have formed special task forces to go around and harass, violate basic Civil Rights and in some cases cause bodily hard or kill “Bikers”. This is our Justice System, which they say is not broken nor does it need to be reexamined. Despite people being released from jail after years of incarceration on a case that was falsely filed, false evidence and cops who lied about what happened. Police do profile bikers, you can deny this, make whatever excuse you want to but Police Profiling Bikers is very in the United States of American. Just like Racism back in the day when Police Profiled Blacks, Police are doing it in 2013 but this time their target is Bikers of all races. MELROSE PARK, Ill. (CBS) — On-duty, they are police officers who took an oath to enforce the law. Off-duty, they formed a motorcycle club that looks like it supports outlaw biker gangs. The Outlaws, an infamous motorcycle club known for violence used to protect its turf. But when Melrose Park Police Sgt Nunzio Maiello founded the Reapers motorcycle club in 2005 he “actually reached out to the outlaws,a motorcycle club that’s been labeled a criminal enterprise by the justice department, to essentially ask permission to ride so there wouldn’t be any altercations,” said BGA Investigator Andy Shaw. The Reapers also wore patches saying support the Outlaws. Not a good idea says an ATF agent who infiltrated criminal biker clubs. “That signifies that they’re affiliated with or aligned with the Outlaws,” said the agent. Then there’s the Reapers name and logo similar to the Grim Reapers, involved in everything from “drug distribution to violent beatings, home invasions, rapes and bombings,” said the ATF agent. At least six Melrose park cops joined the Reapers despite all the controversial images. A problem for David Bradford former president of the Illinois Association of Police Chiefs. Bradford says a bar fight at Josephine’s Bar in Villa Park underscores the conflict. A Villa Park Police report describes the battery of an off-duty Villa Park fireman allegedly hit and injured by a group of Reapers including Melrose Park Cops. “The conflict was my responsibility as a police officer to preserve the peace,” said Bradford. Melrose Park prohibits police from engaging in conduct that is unbecoming for an office or reflects unfavorably on the department. “I was deeply disturbed by it. This is not the image we want to portray,” he said. Late last week, the cops disbanded the Reapers. Sgt Maiello told his chief they never intended to give a negative impression to the public. He said, they intended to have a drug and crime free club that promoted motorcycle safety. The Reapers told CBS 2 they were not affiliated with the Outlaws, but wore the patches for protection. There were no charges in the bar fight because the firefigher would not press charges. CBS 2 found no evidence that they violated any laws. Here is a prime example of the type of injustice Police are involved in, this club has been involved in criminal activity do they fall under the “Gang” definition? Paul Anthony Lee, 36, faced up to 19 years and eight months in prison after a jury convicted the second-striker of evading a police officer, battery on an officer and assault on an officer with a deadly weapon, in reference to his vehicle. The jury deliberated less than a day before returning its verdict in September 2012, two years after the incident. He had been free on a $100,000 property bond but was taken into custody once convicted. Lee’s case made headlines because it was the first case linked to the deadly gas line explosion and fire that significantly damaged the Glenview neighborhood and killed eight. A San Bruno police officer and gang enforcement officer securing the area spotted Lee and a woman on his motorcycle at the end of the fire scene hours after the Sept. 9, 2010 blaze erupted. One officer, checking on Lee’s intent, asked him to dismount the bike but he instead sped away. An officer grabbed Lee’s jacket and was dragged several feet before Lee drove over his foot and sped up to 60 mph through the city to Highway 101. The chase ended in San Carlos when the motorcycle died and Lee was apprehended. Lee reportedly told authorities after his arrest he was riding around the scene to look at the remains and fled out of fear because of previous convictions. At the time of his latest arrest, Lee was on parole for having been sent to prison in 2003 for possession of a controlled substance and a firearm, in 2005 for attempted kidnapping of his ex-girlfriend in front of her family and in 2009 for possession of methamphetamine. Prior to sentencing on the new case, Lee sought a new trial on the basis of ineffective counsel but, after a five-hour hearing that included testimony from his original defense attorney, Judge Lisa Novak denied the request. She also denied the defense request to dismiss the prior strike conviction from sentencing consideration. San Mateo County gangs once stayed on their own turf, operating by world of mouth and using baseball bats as weapons. Now, gangs travel, text message plans and use full arsenals of guns, machetes and even throwing stars to attack one another, according to the local law enforcement who say they must also evolve to keep the criminals in check. Part of that cache was on display Friday as the San Mateo County Gang Task Force, a multi-city, multi-agency group, highlighted the 461 arrests, 61 weapons and thousands of grams of drugs seized during its annual 16-week summer crackdown. The county’s gang activity, particularly associated homicides, is quite different now from before the task force’s inception six years ago, according to Sheriff Greg Munks. Instead of the 16 gang-related murders the year before the county launched the task force, the average is now two to three. Munks said he was publicizing the group’s work now to show that even in these tough budgetary times, it continues operating successfully using its own resources. San Mateo County has approximately 2,700 validated gang members, said Detective Sgt. Leo Capovilla of the Sheriff’s Office Gang Intelligence and Investigation Unit. Displayed in front of Lotti were other souvenirs of the task force efforts: blades, handguns, red and blue baseball bats, semi-automatic weapons, swords hidden in canes — even a heavy piece of rebar attached to a handle. The world of modern gangs is a far cry from two decades ago when Chief Deputy District Attorney Steve Wagstaffe said he prosecuted his first gang case which involved two baseball bats and a golf club. The danger now has escalated and the task force should be commended for facing it, said Wagstaffe, who will take over as district attorney at the end of the year. One new twist to gang culture is “net banging,” in which phones and texting is used to change plans and arrange crimes, Capovilla said. After Los Angeles’ gang problem exploded, officials there warned others not to make the same mistake of not addressing it early before future members even hit junior high, he said. The task force now combines its searches and field contacts with school and diversion programs, Capovilla said. Wagstaffe said there are statistics available on how many of the summer’s arrests lead to prosecution and conviction but that gang case filings are up. Conviction rates, too, are higher than those of other crimes. The flip side of the task force’s success is challenges housing the gang members in the county jail. The overall population can include up to 20 percent gangmember which must be separated so that Sureños and Norteños don’t battle. However, if too many of one gang are housed together they try taking over the pod, Munks said. On top of existing overcrowding at the jail, the gang aspect adds another layer of concern but that does not mean suspects will be turned away or released unnecessarily, he said. “There’s always room at the inn when it comes to getting violent criminals off the street,” Munks said. It never ceases to amaze me that no one investigates the allegations of abuse by gang task force, mainstream media is quick to throw headlines together about gang task force arrested bikers as gang members, but you will never see a headline that tells the truth about how gang task force officers violate on a daily basis, the civil rights and constitutional right of bikers. What will it take for government oversight to look into the illegal activities and actions of these unconstitutional groups of law enforcement. 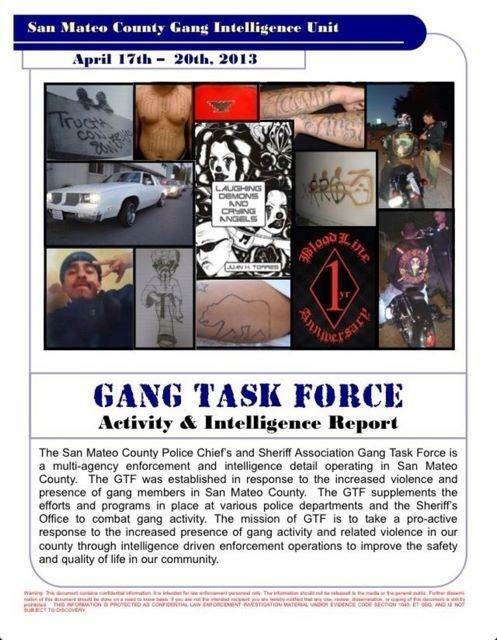 The members of these groups operate off of bad information in a poorly educated as to what a gang member really is, they harass and target anyone who wears a patch or has any type of support gear, patches, and stickers on their person, vehicles or motorcycles. These groups are highly unconstitutional in the way they carry out their duties. 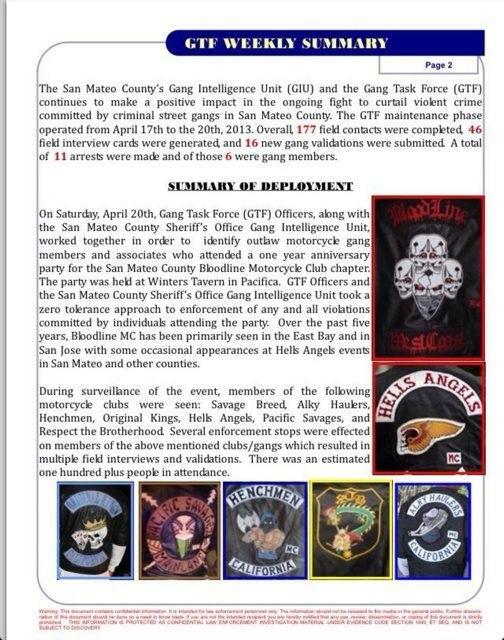 This document alone shows that they are basically standing in the dark and tried to pin gang titles on motorcycle club members. Their intelligence to put it frankly is a joke. They have no clue what they are doing, nor do they have any of their facts straight. Two members of the Bikers for Christ ministry were told by police to leave a public street fair in Manteca, Calif., for wearing vests that displayed the organization’s colors and patches. While Billy Rogers and Steve Wilson walked around Manteca’s annual Pumpkin Fair Sunday, they were approached by two officers who told them they weren’t allowed to wear the organization’s colors while on the event grounds. “Steve took his vest off. I took mine off and turned mine inside out in the presence of the two officers,” Rogers told The Christian Post Monday. He said one of the officers, a sergeant, was okay with the change, so he sent the two men on their way. Rogers told the officers that he and Wilson were on their way back to their motorcycles after the sergeant told them they had to leave. He asked the sergeant why, if there was a dress code, there weren’t any visible signs stating it. He also asked the officers why it was an issue for them to wear the Christian ministry’s colors when there was a beer garden, where people were getting drunk, in the middle of the fair. After Rogers asked his questions, he said, the sergeant told him he didn’t need to know the answers and the issue wasn’t up for discussion. “At that point his partner put his hand on his gun,” Rogers said. He and Wilson then turned around and walked to their bikes, even though the officer did not take the weapon out of its holster. Once they arrived at the place where their bikes were parked, they sent a text message to Dave Bates, the Central Valley Chapter Elder of Bikers for Christ. “I was appalled at the fact that they were asked to leave because of the Christian patch on our vests. It makes no sense to me,” Bates told The Christian Post. He said though they may not have been discriminating against Christians specifically, singling out bikers with dress codes isn’t fair. “Discrimination is discrimination either way,” he said. Dave Bricker, chief of police for the Manteca Police Department, said the dress code is in place to prevent gang violence. The event’s rules, he said, have been in place for 10 years.